Yesterday I put up a piece I found on YouTube of a group of Kenyan engineers building what they believed to be Africa’s first passenger-carrying drone. The video showed them testing it in flight loaded with bags of sugar. This short video from Sami’s channel on YouTube shows the machine in flight, carrying a passenger. The film begins with the team thanking the governor of Nairobi, Mike Sonko, before showing the flight. The man himself wasn’t terribly happy in the air, as a caption reads that it was only then that they realized he was frightened of heights. The photo of the team at the end shows that the majority of its members are Black Africans, but there’s also a White guy and an Asian. As I said in my earlier post about the vehicle, this shows the immense creativity of the people of Africa, a creativity that is being held back due to the continent’s poverty and kleptocratic politicians. If these could be overcome, and the continent reach the same stage of develop as the industrial West, we would be astonished at what they could achieve. This video offers a glimpse of the massive potential waiting to be unlocked. This is great stuff! It’s from Stiv M’s channel on YouTube, and shows a group of Kenyan engineers testing what they hope will be the first passenger-carrying drone in Africa. It’s a large vehicle powered by four small propellers, rather like fans, mounted at each corner. To test its ability to carry weights, the crew load it with bags of sugar. To my mind, this shows the immense creativity that’s locked away in the African people. At the moment, the continent’s poverty and lack of technological development is stifling the immense potential that’s clearly there. If the continent was as developed as the industrial north, who knows what they could achieve? The British newsreader, George Alagiah, grew up in Ghana. He says in his autobiography that at the time he was there, it was confidently expected that the first non-western nation in space would be Ghana, not India. Sadly, it hasn’t happened. But the spirit and inventiveness is clearly there. This is a fascinating piece from yesterday’s I newspaper, for the 22nd November 2018. It reports that Dr. Steven Barrett and his team at MIT have built an airplane that flies through channeling air underneath its wings using electrically charged wires hung below them. A revolutionary electronic aircraft propulsion system inspired by Star Trek has been tested on a working model for the first time. The five-metre wingspan glider-like plane has no propellers, turbines or any other moving parts, and is completely silent. 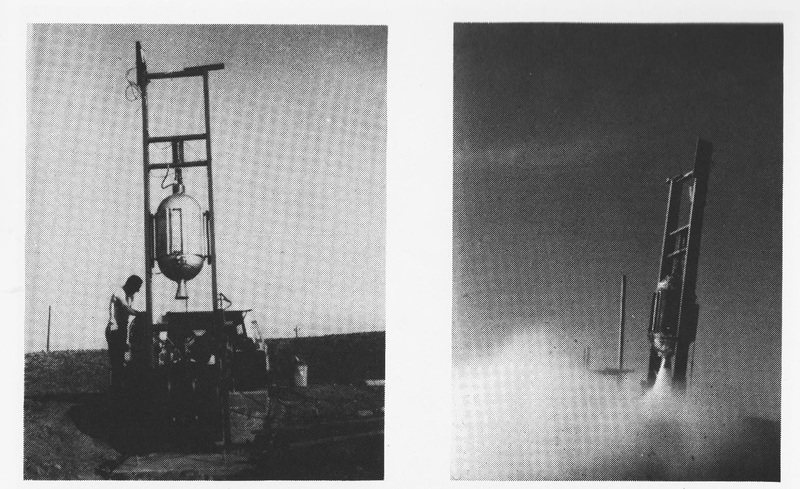 Instead, an “ionic wind” of colliding electrically charged air molecules provides the thrust needed to make it fly. In the tests, the battery-powered unmanned aircraft, that weighs just five pounds, managed sustained flights of 60m at an average height of just 0.47m. But its inventors believe that, like the early experiments of the Wright brothers more than 100 years ago, such small beginnings will eventually transform the face of aviation. In the near future, ion wind propulsion could be employed to power quiet drones, the team predicts. Further down the line, the technology could be paired with more conventional propulsion systems to produce highly fuel-efficient hybrid passenger planes. Lead researcher Dr. Steven Barret, from Massachusetts Institute of Technology (MIT) in the US, said: “This is the first-ever sustained flight of a plane with no moving parts in the propulsion system. He revealed that he was partly inspi9red by the TV sci-fi series Star Trek. He was especially impressed by the show’s futuristic shuttle crafts that skimmed through the air producing hardly any noise or exhaust. “This made me think, planes shouldn’t have propellers and turbines,” said Dr. Barrett. “They should be more like the shuttles in Star Trek that have just a blue glow and silently glide. The test aircraft, described in the journal Nature, carries an array of thin wires strung beneath the front end of its wings. A high-voltage current passed through the wires strips negatively charged electrons from surrounding air molecules. This produces a cloud of positively charged ionized air molecules that are attracted to another set of negatively charged wires at the back of the plane. As they flow towards the negative charge, the ions collide millions of times with other air molecules, creating the thrust that pushes the aircraft forward. Test flights were made across the gymnasium at MIT’s duPont Athletic Centre, the largest indoor space the scientists could find. The article also carried this diagram of the aircraft and its engine. The illustration is entitled ‘How It Works’, and shows picture of the plane, with an arrow saying ‘Battery in fuselage’. 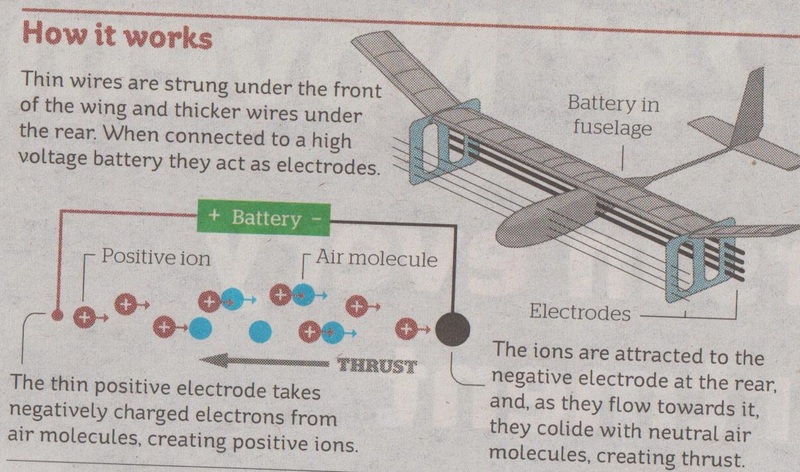 There’s also a diagram of the electrically charged particles and the wires connected to the battery that the plane uses instead of a conventional engine. Thin wires are strung under the front of the wing and thicker wires under the rear. When connected to a high voltage battery they act as electrodes. The thin positive electrode takes negatively charged electrons from air molecules, creating positive ions. The ions are attracted to the negative electrode at the rear and, as they flow towards it, they collide with neutral air molecules, creating thrust. The plane reminds of me of the atmospheric aircraft in one of Alistair Reynold’s SF novels, Revelation Space, which fly through heating up the air below them. The propulsion system’s also related to the nuclear electric propulsion used, or proposed, for some spacecraft. This also uses an electrically charged grating to channel and increase the thrust of charged particles generated by a nuclear reactor. As I understand it, the amount of thrust generated by this type of rocket engine is small, but because it’s constant it can eventually build up over time so that the craft is flying at quite considerable speed. An ion-driven plane is a fascinating concept, though it won’t be powering passenger craft just yet. But you wonder how many UFO sightings will be generated by the experimental and prototype craft which will be designed and built after this. Long time readers of 2000 AD may remember the Gooney Birds. 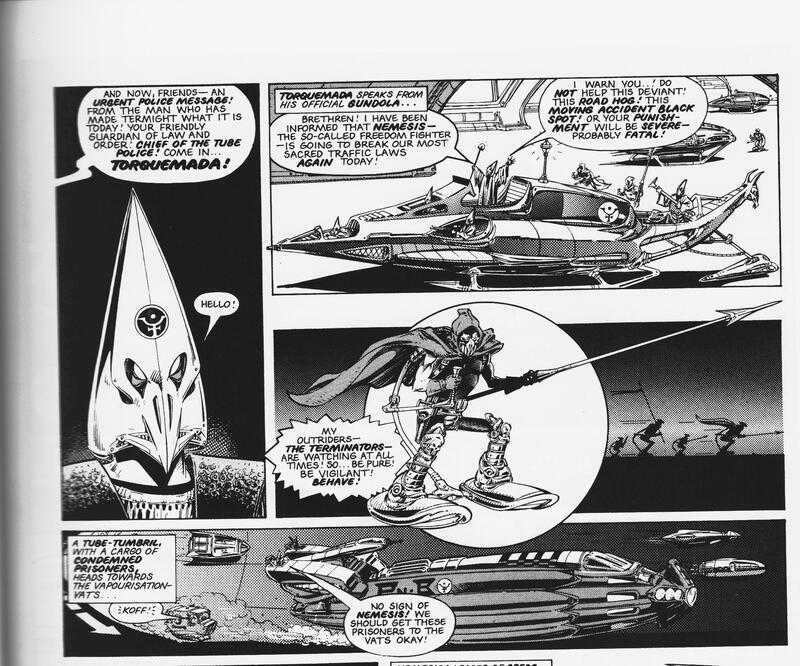 These were vast, predatory metal birds evolved from Concorde, that appeared in the second Nemesis the Warlock story, ‘Killerwatt’, back in Prog 178, when one of them attacked a train carrying the strip’s villain, Torquemada, as it passed overland. Looking through the Sciencefictiongallery tumblr site, which shows pieces of classic and not so classic SF art, I came across this similar piccie by Roger Dean on the page for the 5th February 2014. It isn’t quite the same thing. 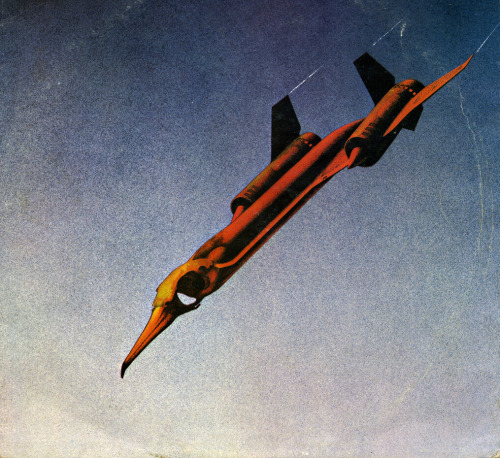 Dean’s picture is of a Blackbird spy plane, rather than Concorde, but the idea’s the same. 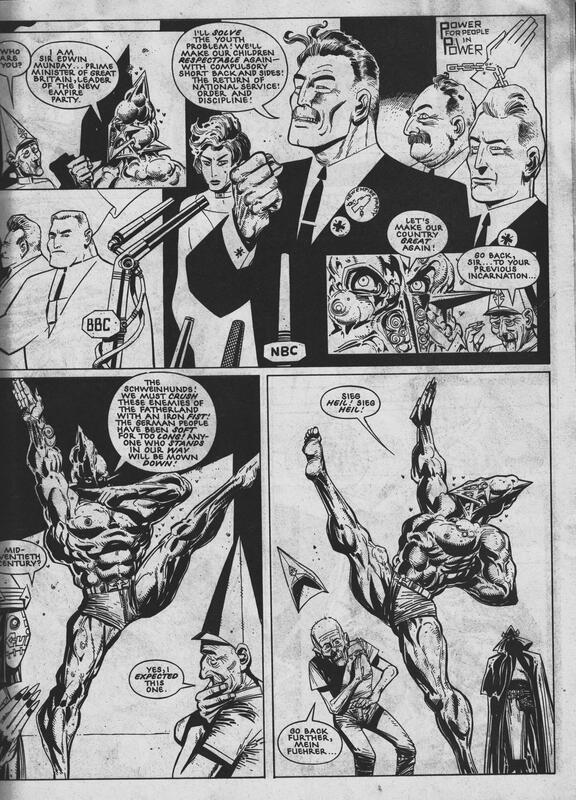 The crowd at 2000 AD took some of their inspiration from the popular culture around them, including pop music. It was why the revived Dan Dare was made to look rather like Ziggy Stardust. The two earliest Nemesis the Warlock stories, ‘Terror Tube’ and ‘Killerwatt’, were published as part of a ‘Comic Rock’ series of strips, which were explicitly inspired by the pop music of the time. In the case of ‘Terror Tube’, this was the Jam’s ‘Going Underground’. In fact, the story had its origin in Mills and O’Neill wishing to stick two fingers up to the comic’s editor, Kevin Gosnell. Gosnell had censored a chase scene in the ‘Robusters’ strip on the grounds that it was too long. So when he was away on holiday, Mills and O’Neill created a story, ‘Terror Tube’, that was just one long chase. 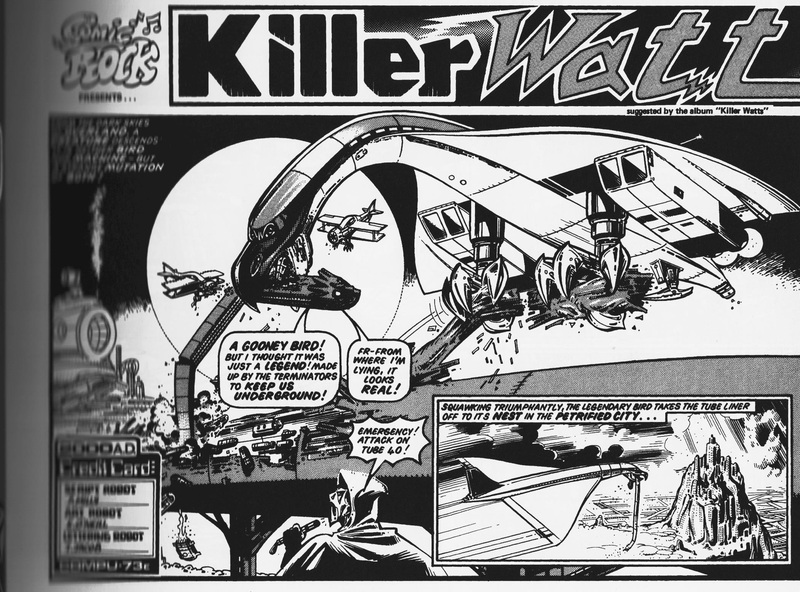 As the strip itself acknowledged in its titles, the second Nemesis story, ‘Killerwatt’, was suggested by the album ‘Killerwatts’. Roger Dean is known for the superb artwork he did for various record sleeves. So you’re left wondering whether Dean’s depiction of the Blackbird spy plane as swooping bird of prey served as the inspiration for the Gooney Birds in the Nemesis the Warlock story, or if it was just an idea that was going around at the time, and which different artists had independently. 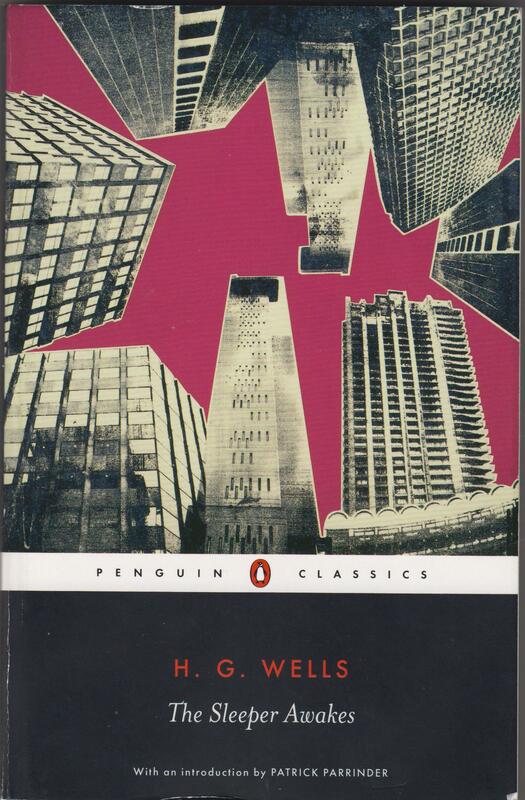 Either way, ‘Killerwatt’ and its predecessor, ‘Terror Tube’, blew my teenage mind with their depiction of a ravaged, far-future Earth, populated by weird creatures and under the malign heel of Torquemada and Terminators. They provided a solid basis for the Nemesis the Warlock strip proper when this later appeared, and helped to make it one of 2000 AD’s most popular strips. A little while ago I put up a series of posts about real, 19th century inventions, which now seem like the weird machines of Steampunk Science Fiction. This is a subgenre, which imagines what the world would have been like, if the Victorians had invented spacecraft, time travel, interdimensional travel and other elements of Science Fiction, or had completed and fully developed real inventions like Babbage’s mechanical computer, the Difference Engine, steam carriages and dirigible aircraft, like that flown by the French aviator Giffard in 1854. One of these real Steampunk inventions was the monorail. A steam-driven monorail system was designed by an American inventor and entrepreneur. This astonished me, as I always associated the monorail train with the technological optimism of the 1960s and ’70s. It was an invention for a technological age that never happened. After writing the article, a reader posted a comment on the piece kindly pointing out that a steam monorail system had been built in Eire. the track and its train have been restored, and are now a tourist attraction. The commenter included a link, and if you go to that website, you’ll see the train in question. It is very definitely an Irish train, as its been decorated very patriotically in green. This hasn’t been the only example of such trains I’ve found. They even existed as miniature toys. 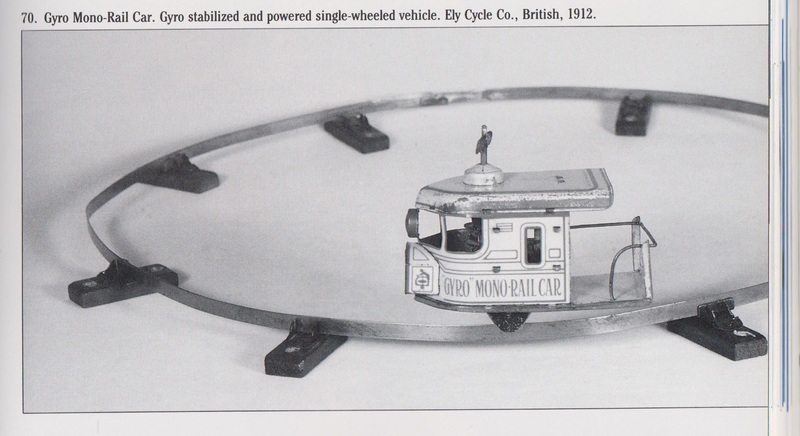 Looking through the book Mechanical Toys: How Old Toys Work by Athelstan and Kathleen Silhaus, with photos by Nelson McClary (New York: Crown Publishers 1989) I came across the illustration below of a toy monorail train, stabilized with a gyroscope and powered by a single wheel. It was produced by the Ely Cycle Co., of Britain, in 1912. It was first patented in Britain in 1908, and then in Germany in 1911, where it was also manufactured by Suskind. The text notes that it was stabilized by a gyroscope long before Sperry used it in aircraft and ocean liners. The use of a single wheel is also like the various Science Fictional vehicles that similarly have only one of these, like the monocycles in Harry Harrison’s The Stainless Steel Rat. 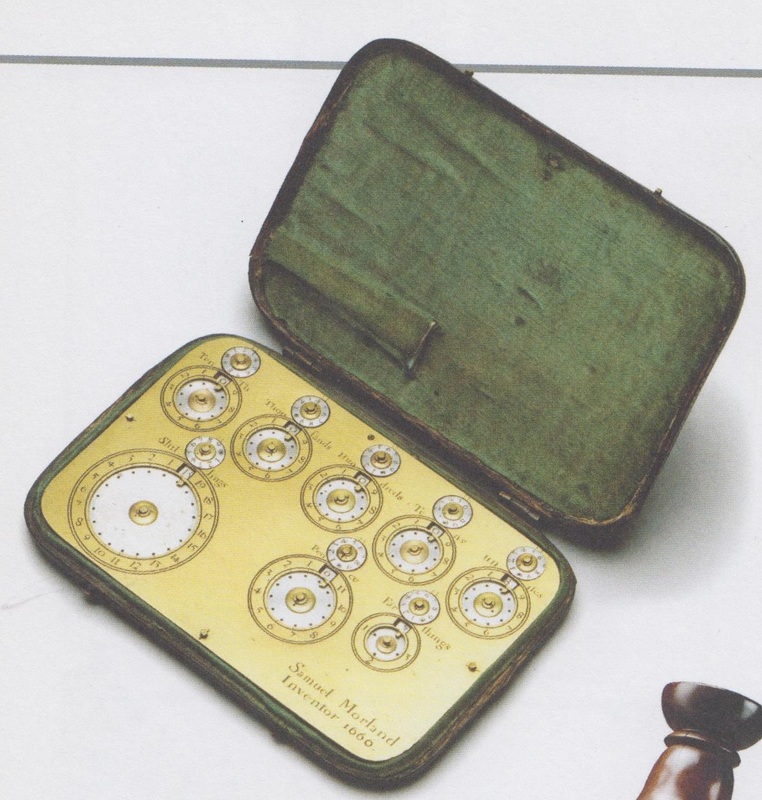 This toy, and others like it, show a whole world of Victorian and Edwardian invention that seemed to anticipate a technological future that never quite happened, as well as the immense inventiveness of the manufacturers. Looking through one of the secondhand bookshops in Cheltenham yesterday, I found a copy of the Souvenir Guide to the Science Museum. This was a photographic guide to some of the Museum’s exhibits, which include Islamic alchemical apparatus, an iron lung, the wright flier, and a BBC television receiver from the 1920s among many, many others. One of the early pieces of scientific equipment is a mechanical calculator constructed by the English inventor, Samuel Morland in 1666. French mathematician Blaise Pascal made the first working mechanical calculator in 1642, and several mathematicians and inventors attempted to emulate or improve on his design. Morland’s device, shown here, could add, multiply and divide; the wheels were operated by a steel pin that was stored in the slot in the machine’s lid. 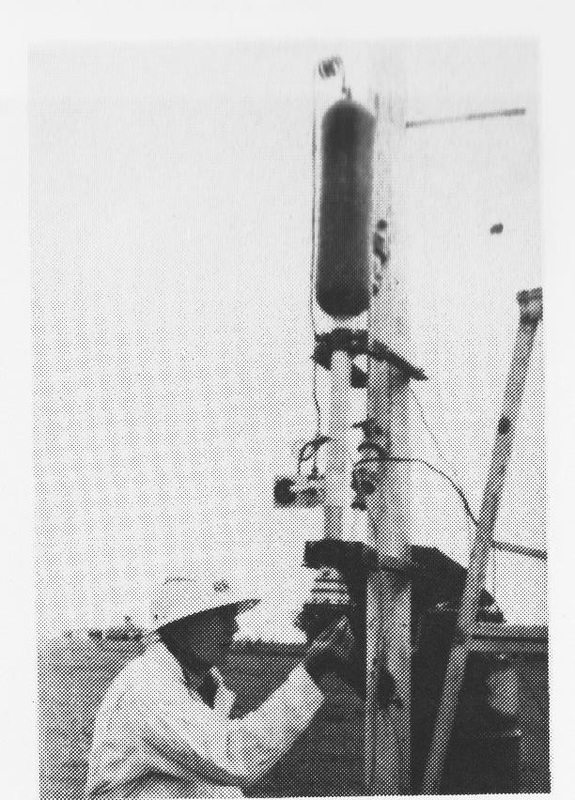 Morland also invented a megaphone – or, as he called it, the ‘Tuba Stentorphonica’ and a water pump for spraying water to put out fires. 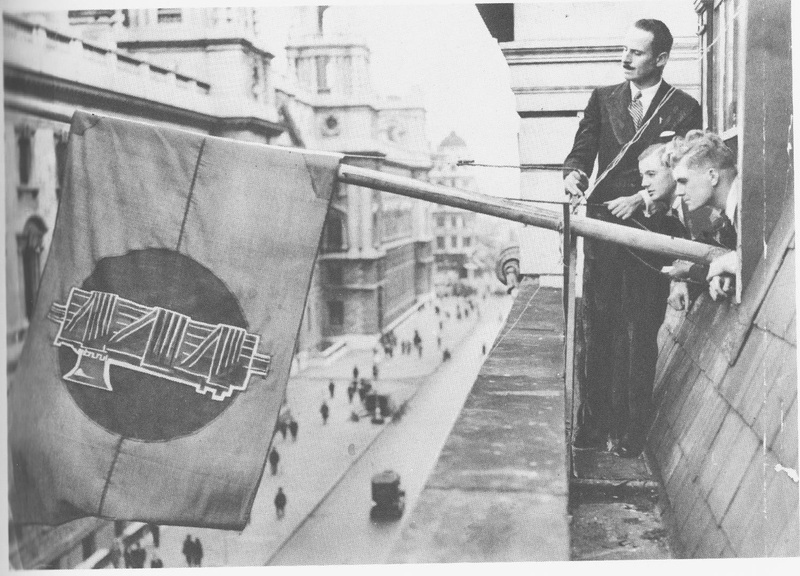 (p. 40). The Science Museum is, of course, also the home of the most famous of the historic calculating machines, Charles Babbage’s Difference Engine, which has been hailed as the world’s first programmable computer. It was also the central theme of Bruce Sterling’s and William Gibson’s Steampunk SF novel, The Difference Engine, which imagined an alternative 19th century, in which the Difference Engine had been built and ushered in a steam-powered information age in a Britain governed by a scientific elite under the premiership of Lord Byron. It seems to me that Babbage’s machine was the culmination of a long process of invention, where mathematicians, scientists and engineers designed and constructed mechanical calculating machines. Pascal’s was the first of these. But I think the ultimate idea actually goes back to the 14th century Spanish poet and mystic, Ramon Llul. Alan Chapman, the astronomer and Christian apologist, says in his book, Slaying the Dragons, that Llul attempted to show that God’s existence was encoded in the structure of mathematics itself, and that this inspired a number of later writers to design calculating machines.